When you use Zanussi's ZCI66278XA, you have a range of meal prep options too. The top oven comes with four programmes, and its variable integral grill works as both a dual circuit grill and a full grill - on top of conventional cooking. You'll also find three programmes for the main oven, including one for defrosting, so you can cook food from the freezer safely. Plus, Zanussi's innovative Thermaflow® Fan is built into the main oven. Its clever placement prevents the transfer of flavour from one dish to another. Not only this, but it also delivers shorter cooking times at lower temperatures - saving you time and money. Zanussi has even equipped the ZCI66278XA with a fast-heating induction hob. This takes less time to heat up when compared to electric hobs, so your food will be ready in a flash. And, this extra power won't put you out of pocket. The ‘A' energy efficiency rating for this cooker makes it kind to both the environment and your bills. 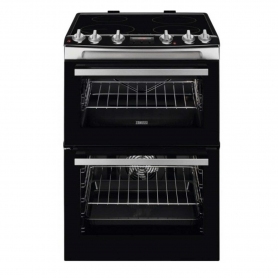 This Zanussi electric cooker features intuitive, easy-to-use dial controls and a mechanical display. Together, they help to make cooking feel how it should - simple and fun. Thanks to the handy lights inside and the triple glazed glass doors on both of the ovens, you'll always be able to see how your food is looking while it's cooking. So, no more burnt bakes or cold casseroles. With two shelves in the main oven and one in the top, you can have several meals on the go at the same time - particularly handy if you're preparing a large family meal. There's also plenty of space to use, with 77 L net in the main oven, and 39 L net in the top conventional oven.